More and more of us are considering the environmental impact of the products we buy. But do we really know what we’re getting when it comes to our washing-up liquid? Our latest lab tests show clear differences in performance, showing which washing-up liquids are likely to last longer and leave your plates sparkling. One washing-up liquid cleans up with an excellent 85% test score, while another sinks to the bottom with a meagre 37%. But this time we’ve gone even further, looking behind the scenes at brands’ eco credentials, so you can make sure you choose a product that’s good for the planet as well as your dishes. Read on to find out what we uncovered, or see all our recent results in our latest full washing-up liquid reviews. What does ‘eco’ really mean? We asked 11,095 Which? 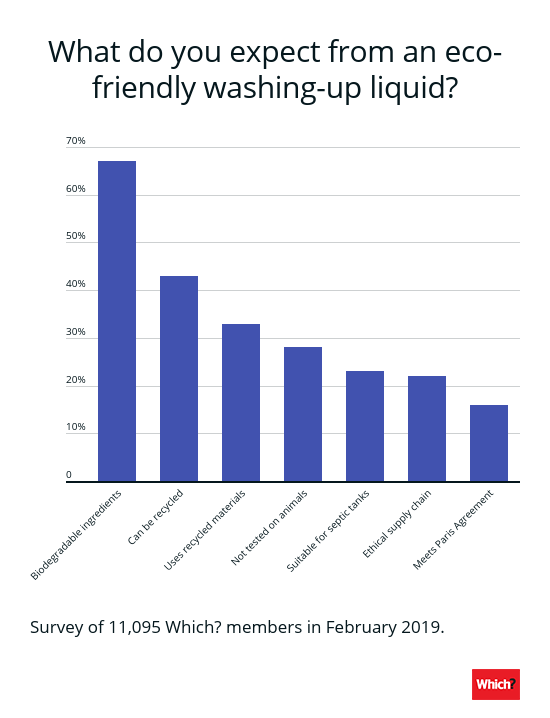 members in February 2019 what they expect from an eco-branded washing-up liquid, and the results showed that lots of us are confused about what we can expect from our eco products. While consumers may have an idea of what they expect from a ‘green’ product, there’s no real defined definition. Being ‘eco-friendly’ can mean different things to different manufacturers. And it’s clear that consumers’ expectations can vary, too. However, whether they’re labelled as being ‘eco’ or not, there are minimum ecological standards that all washing-up liquids sold in the UK have to adhere to by default. EU law states that surfactants (the main detergent ingredients that cut through grease) have to meet specified standards for biodegradation. This means the extent to which the substance breaks down into carbon dioxide, water and mineral salts, and can be absorbed back into the environment. This means that, in some way, all washing-up liquids can be considered eco-friendly. How green really are detergent brands? We asked major washing-up liquid brands how sustainable their products are, based on specific criteria. Compare the results in the table below. All these washing-up liquids have biodegradable ingredients, are suitable for septic tanks and are not tested on animals. The main difference we found between ‘eco’-branded and standard washing-up liquids is in their ingredients. Ecover Lemon, Ecover Zero, Waitrose Ecological and Tesco Eco Active are all free from crude oil. Ecover is the only brand to meet every eco criteria we asked about. It’s the only brand that uses a 100% recycled bottle, and the only brand to offer a refill scheme, which allows you to dramatically reduce your plastic consumption. Find a refill stockist near you with its store locator. Tesco is the only brand that’s had its range certified by the independent EU Ecolabel. It told us that its factory recycles ‘all materials, including plastic waste, metal waste, cardboard and all liquids. Everything is processed to be used again’. 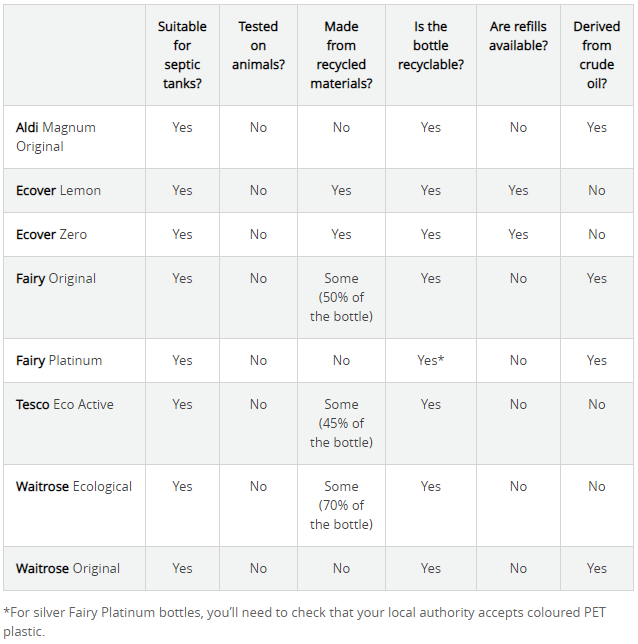 All the bottles we asked about are widely recyclable, although with Fairy Platinum you’ll have to make sure your local council accepts coloured PET plastic. The caps are all made of polypropylene (PP), which is slightly less widely recycled, but still shouldn’t be a problem in most parts of the country. Which washing-up liquid should I buy? We’ve broken down our sustainability criteria so that you can choose which elements are most important to you when choosing a washing-up liquid. For example, if animal testing is your main priority any of the products would be suitable; for minimising your plastic usage you might prefer Ecover. However, you should also consider how well your washing-up liquid cleans. 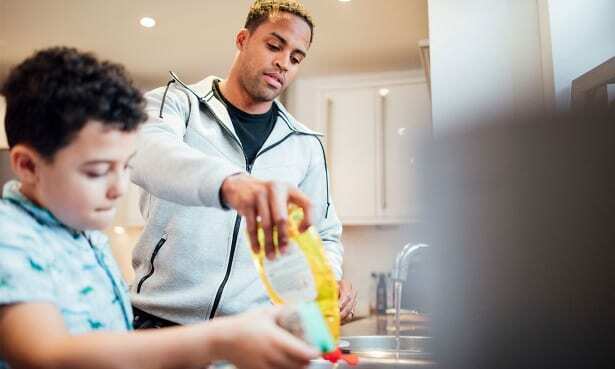 If you get stuck with a Don’t Buy that’s bad at cleaning, you’ll be using more product to scrub at your dishes, meaning you’ll use more water to wash up with and you’ll be making more frequent trips to the supermarket to replace the bottle. 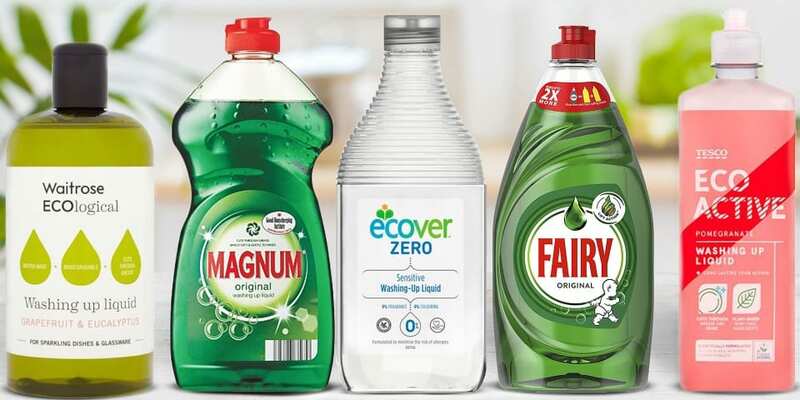 According to Kishan Chauhan, principal scientific advisor at Which?, ‘it may be more sustainable to choose a Best Buy washing up liquid that will last for longer and therefore reduce the amount of plastic you use’. Find out which washing-up liquids top the scoreboard in our round-up of the latest test results.